Our Patron Saint, Catherine (whose feast is celebrated on April 29th) was born inSiena, Italy in 1347. She lived a short life by modern standards, but an extremely full one. In her lifetime, she saw famine, plagues, numerous civil wars, and the papacy moved from Rome to Avignon and back again. At the end of her life, the great western schism pitted pope against anti-pope. From her earliest childhood, Catherine had a great devotion to the Blessed Sacrament and to the Dominican order. Her parents did not want her to become a religious, but finally at the age of sixteen, she entered the Sisters of Penance of St. Dominic. During her life she had numerous visions and prolonged ecstasies. She ate very little, living mostly on the Blessed Sacrament. 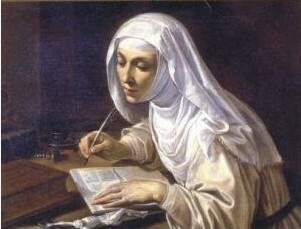 Catherine was one of the most brilliant theological minds of her day, although she never had any formal education. She authored a book of Dialogues, though she herself was not able to write. She dictated most of her writings to the band that had gathered around her. Catherine died in 1380 at the age of 33. She was declared a Doctor of the Church by Pope Paul VI in 1970. St. Catherine of Siena, pray for us!